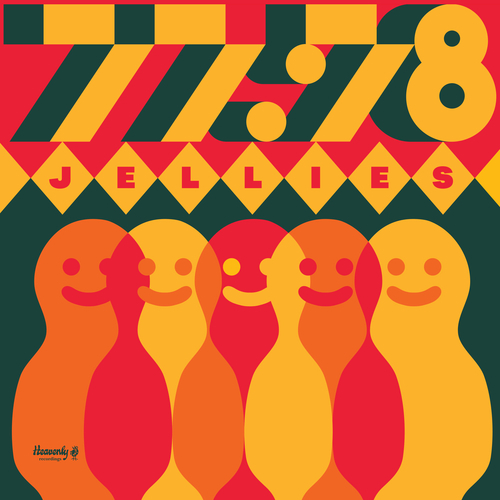 77:78 release their debut album 'Jellies' via Heavenly Recordings on July 5th, 2018. This is the new musical project of Aaron Fletcher and Tim Parkin of The Bees. We have SOLD OUT of the limited signed vinyl edition. All vinyl is still jelly orange & the CDs are also signed. All vinyl come with a download and code. 77:78 is the new project from Aaron Fletcher & Tim Parkin, card carrying members of the musical kaleidoscope that is The Bees, have announced details of Love Said (Let’s Go), their first release for Heavenly Recordings having recently signed to the label. The track was previously available as a limited edition white label seven which sold out within 48-hours and was the catalyst for Heavenly to sign the band having being blown away by the track having picked up a copy while out record shopping. “The song’s working title was Jelly because it has this soulful balearic groove that just wobbles! Lyrically the vibe is saying “keep on keeping on”… take life's punches but shine on." Set to pick up where the Bees left off, Love Said (Let’s Go), bodes well for the album due later this year, which was recorded at their Isle of Wight studio HQ and musically picks it way from sublime west coast harmonies that recall the frayed beauty of the Beach Boys Smiley Smile , to the ramshackle dub of King Tubby via the playfulness of early Syd Barret. "If Aaron Fletcher and Time Parkin had control of the weather, they couldn't have timed the release of their first album as 77:78 any better: it's a heatwave of a record, sunburned and slightly delirious." "They’ve crafted 11 songs that show off their love of retro sounds, an infectious joy for life, a good melody and a catchy chorus." "A wonderfully eccentric collection blessed by the same harmonies that made their other band so delightful." "Jellies is a remarkable mature ensemble of perfectly-crafted tunes"
"An enjoyable all-ages show for anyone who believes there's never any time but the present."